Located near Cedar and Fairmount in Cleveland Heights, Nighttown is quite the eclectic joint. Peppered with a variety of vintage memorabilia (such as tables made from the floorboards of an old Cleveland elementary school and a circa-1750 English wall clock), stained glass, and other works of art, along with the “ambiance of Irish pubs and turn of the century New York bars,” this restaurant is nothing if not unique. Oh, and they’re one of the top-rated jazz clubs in the world. No jazz for us on this night (as that would require staying out late, something that hasn’t really happened in, oh, about the last three years), but we did get to sample some of the food, which was really the main point anyway. The menu is diverse, with some focus on pub-style food, but there’s quite a range of dishes. 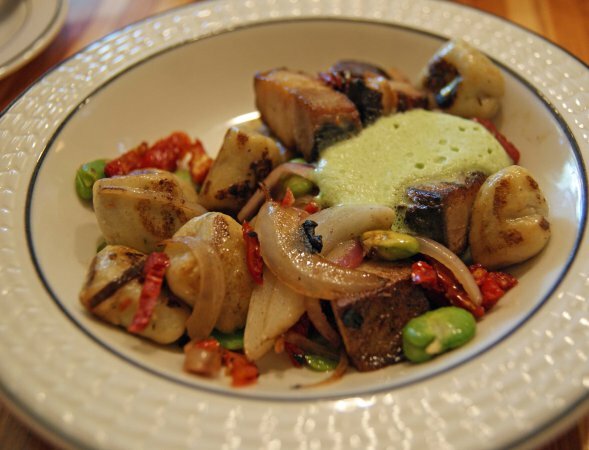 We opted to try the Gnocchi and Bacon for starters, combining cubes of thick-cut bacon, melt-in-your-mouth homemade gnocchi, and interspersed with fresh fava beans, sun-dried tomatoes, and a whipped basil cream. The chunks of bacon provide a good deal of substance, and added a heartier feel than slices or crumbles would have – the more bacon the better. The gnocchi were irresistibly light, and the tomatoes contributed some much-needed acidity to the richness of the rest. The basil cream kind of dissolved into everything else, so it was hard to get much of that flavor, but it was pleasant when we did. 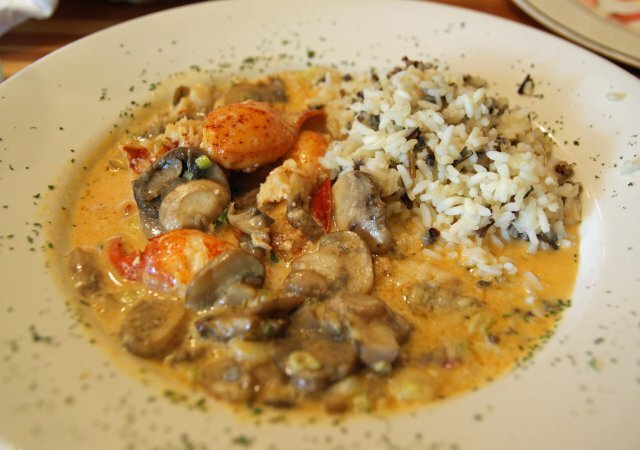 For entrees, S tried the Dublin lawyer, the house specialty – tender, fresh lobster sauteed in a cayenne butter cream sauce, with mushrooms, rice and Irish whiskey. Lobster is always good, especially when it’s buried in a butter cream sauce. This had just a hint of spice, and wasn’t as rich as the description would have you believe, so you don’t leave feeling too heavy. The reputation of the dish is well-deserved. 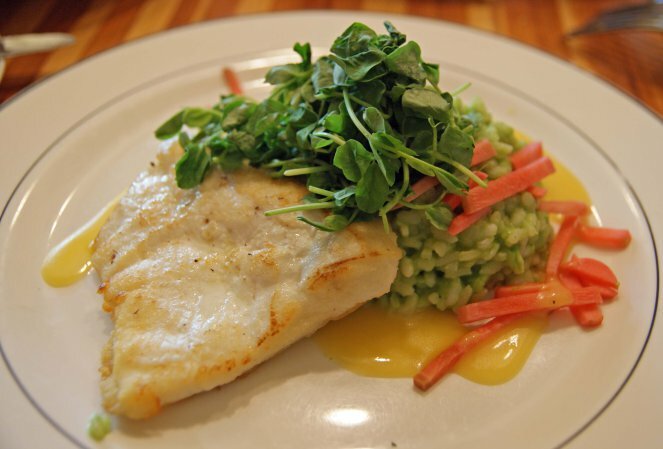 I decided on a seared halibut, served with a pea risotto, pickled radish, and topped with pea tendrils (sprouts, or the tops of the plant) and an orange citronette (like a vinaigrette minus the vinegar). 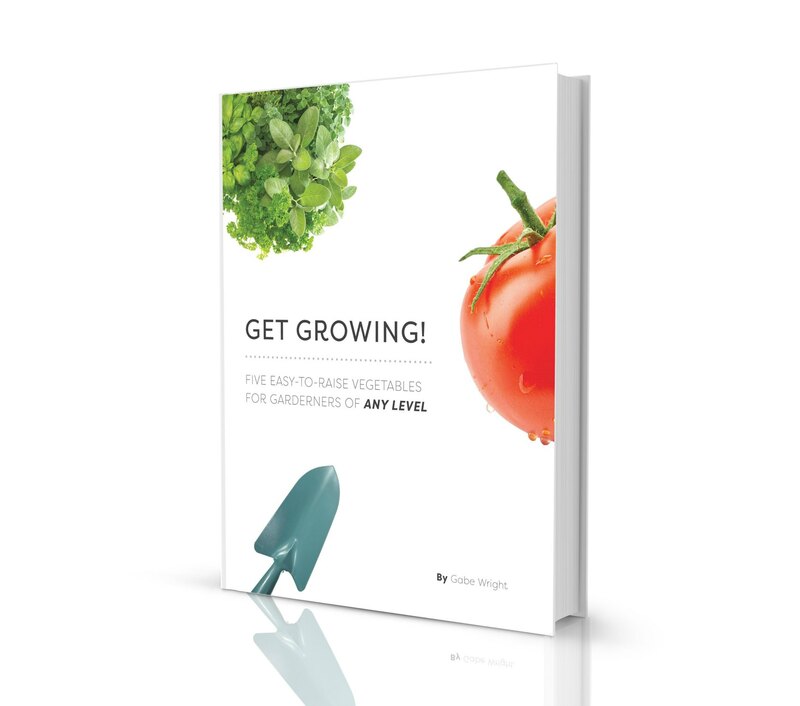 Really fresh, a little earthy-tasting, and highlighted by the bright citrus notes and mild zing of the radish. And for dessert, a lavender panna cotta. 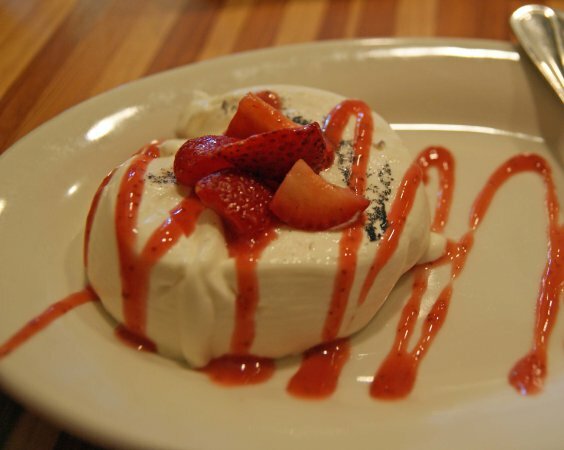 Thick and creamy, but the lavender flavor was slight to nonexistent, and what there was probably got overwhelmed by the strawberry sauce. It was still good, just lacking lavender-ness. The verdict: Nighttown earns five stars out of seven. The food was well done, service was decent, and most entrees are under $20. Someday perhaps we’ll make it back for the music.